The first phase was successful, yielding a pale green solid that quickly settled at the bottom of the bottle, which was followed by a black solid that settled very slowly. First results were obvious after 24 hours, and by two weeks, all new sediment appeared black. Even with such a simple mixture of elements, it’s not easy to identify the resulting sediments. 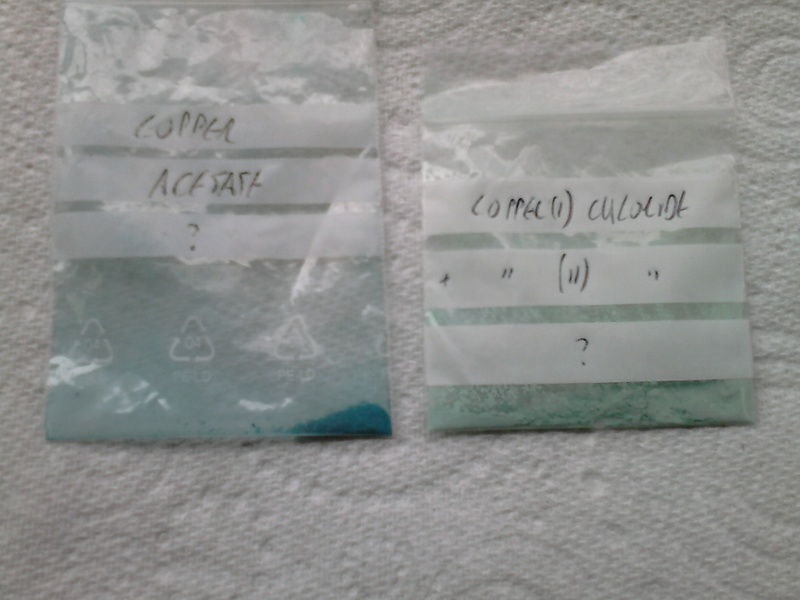 Ignoring small amounts of dissolved gases and other impurities, the samples contain Copper (Cu), water (H2O) and salt (NaCl). From these, a range of chlorides, oxides and hydroxides are possible, and the sodium (Na) is presumably going to do something. I started the second phase last week. 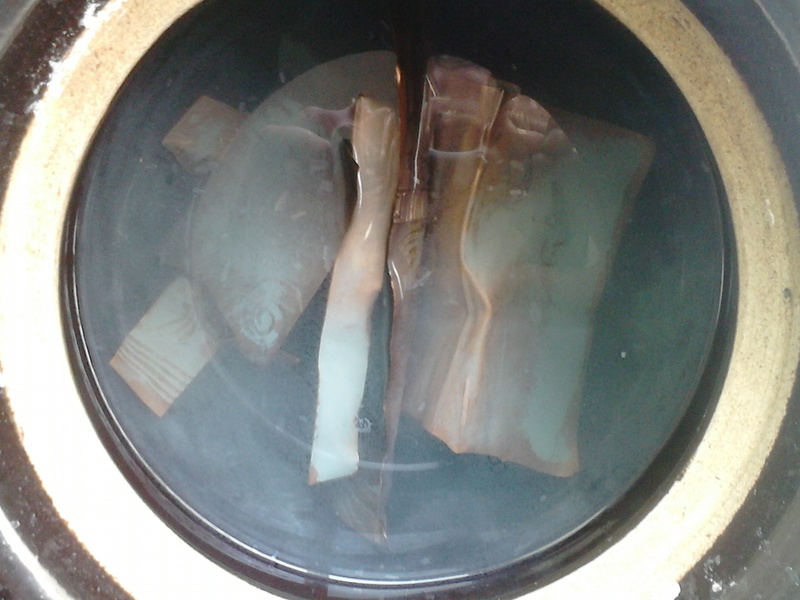 This time, an opaque glazed pot with a lid was used, and filled with approximately 1 litre of brine, and several sheets of copper foil – the aim being to maximise the surface area. The pot is in a warm place, but conditions are otherwise close to ambient – these experiments are all about single-stage processes, which could be run continuously if a workshop required it, simply by leaving a container in the corner of the room. It’s not a question of efficient production of chemicals, more a matter of whether anything useful can be produced. 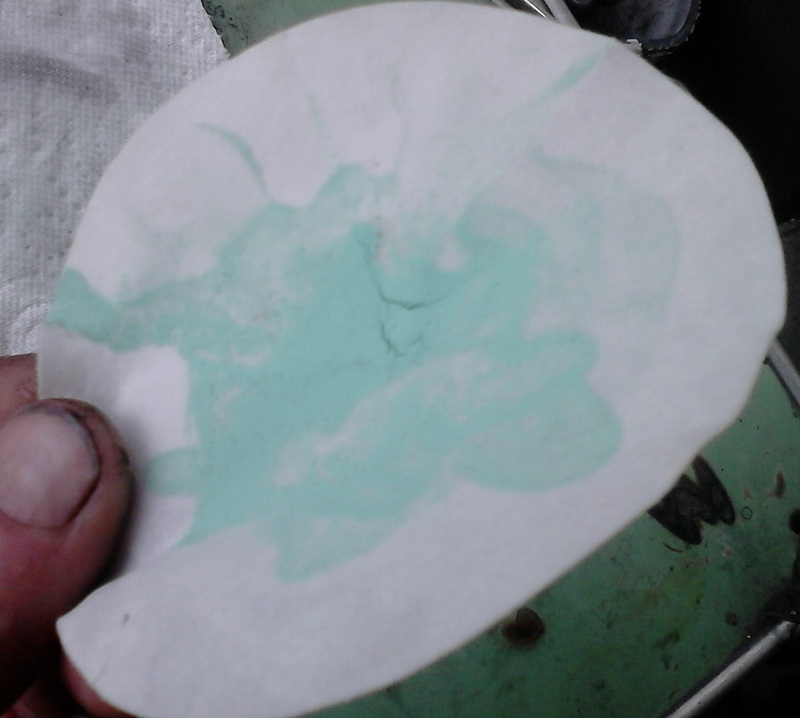 Again, within a day, sediment was collecting on the copper foil, and after a week, I was able to filter a teaspoon of the pale green material, which was dried, and put to one side. The brine, including suspended particles of green, was put back in the pot with the copper. As yet, there is no sign of the black sediment, but this could change, as the contents of the brine change. The black stuff is probably Copper(II) Oxide, and it appeared form in the brine during phase 1, rather than on the surface of the copper (very different to the water and copper control, which has a slick black coating on the metal, but no sediment or suspended particles). But what is the sodium doing? If it forms sodium hydroxide (caustic soda), it should be detectable by touch – it has a strange greasy feel between the fingers – and it should raise the pH of the brine. I’ll leave this one running for a few weeks, and then move onto phase 3, to see if I can isolate the variables, like pH over time, and accurately measured ingredients. This is all well and good, but how does it connect us to medieval practice? For most artisans, the chemistry would be unimportant, perhaps even unknowable, in their eyes. The results are what matters, and this process yields a pale green powder, very vivid (the camera doesn’t do it justice). For comparison, look at the sample next to the verdigris, and consider the spectrum of colours that could be gained by combining them Stability is important for pigments, and will be interesting to observe over time. Oil-based media will probably protect them better than water-based. 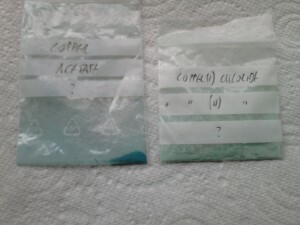 These are mixtures of compounds, (“a real dog’s breakfast”, according to @sellathechemist), and they can be hydrous or anhydrous, so they will be affected by exposure to humidity and atmospheric gases. However, it is the metallurgical chemistry that interests me most of all. As a method of surface finishing, intential corrosion of metal objects is possible for any period, and would yield compounds like this. Likewise for accidental corrosion. Copper appeared early in the history of metalwork, and whether they did it intentionally or as a byproduct of some other process, easily obtainable chemicals like seawater would furnish even the most primitive artisan with a colour palette, and something even more important. There is a method of soldering called eutectic, diffusion or colloidal soldering, used by goldsmiths for thousands of years. It depends on the eutectic point of gold/copper alloys, a high carat gold (above 72.5%), and finely divided copper; various copper salts are called chrysocolla in the texts, literally gold glue. The ease of producing compounds under ambient conditions suggest that finely divided copper would not be an exotic product, but instead something that could be manufactured in a primitive workshop environment (containers are the biggest challenge), offering a lower yield than copper-bearing ores and other naturally occuring compounds, but requiring significantly less effort to source and process. Hi Jamie, I’ve been experimenting by printing rusty objects onto paper and cloth using tea and vinegar to release the oxides. So now i’m thinking of taking this a step further and I’m going to try making artists pastels. 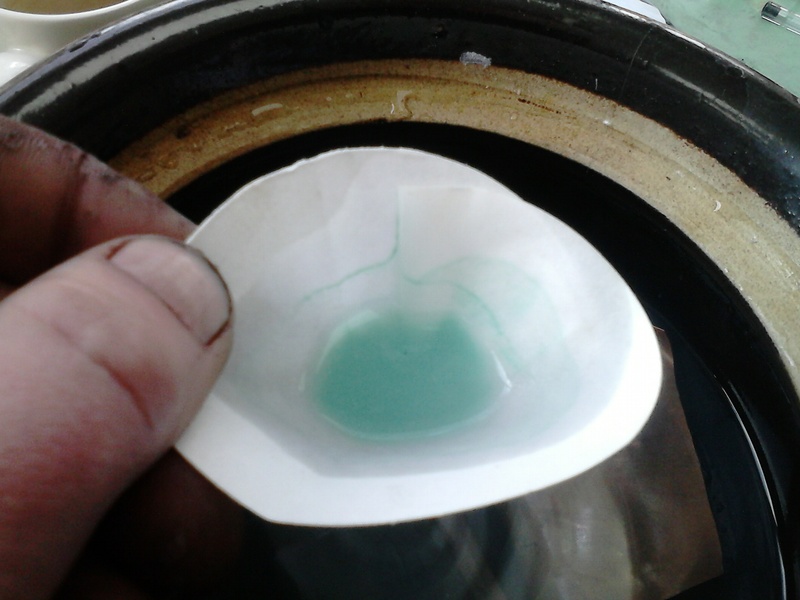 I wasn’t sure how to collect enough oxide & verdigris do this but now I will use your fuming technique – so simple. I just need to be patient! Thanks so much for your fascinating projects and insight.